Earphones for groups with more than 15 people (for Uffizi and Academy Gallery from 7 participants). Entry/Admission - Gallerie Degli Uffizi. One of the most important art collections in the world. Discover how the art of painting developed over the centuries. Your knowledgeable guide will explain the works of the greatest artists from the Middle Ages to the Renaissance: Giotto, Botticelli with its famous Birth of Venus, Leonardo da Vinci, Michelangelo, and many more. Ponte Vecchio is one of the symbols of the city of Florence and one of the most famous bridges in the world. The Accademia Gallery is not only the “David Museum”, it also houses an important collection of paintings from the 14th to the 16th century and a very impressive collection of instruments of the past. 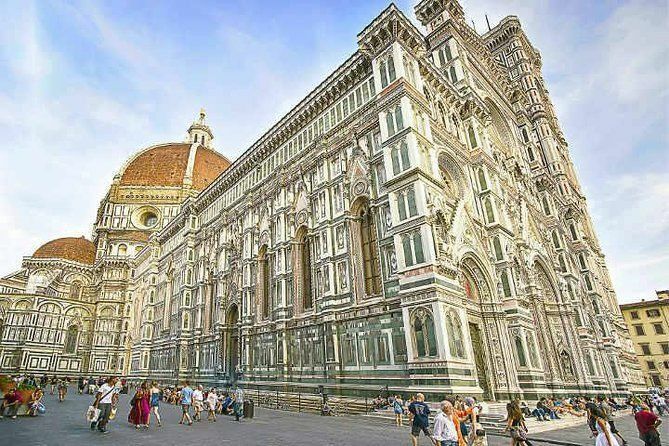 Known as the cathedral of Florence, it is the main Florentine church, symbol of the city. The Ancient Roman city center and the market square during the Middle Ages. We are a travel agency with great experience in tour guiding and tour planning. We are a varied and dynamic team, that enjoys their job and sharing their love for art and culture with whoever might be interested in visiting our worldwide famous territory. Our perfect location in the heart of Florence within no more than a 5 minutes walk from all of the main sights makes us forever present and ready to smoothly solve any possible last minute issue. The corridor built by Giorgio Vasari in 1565, all the way to the Pitti Palace and the Boboli gardens (on the other side of the river Arno, right in the Oltrarno district), wanted by Cosimo I de’ Medici. Called also Loggia dei Priori or Loggia dell'Orcagna. Palazzo Vecchio (the Old Palace), symbol of the political life in Florence. Salone dei Cinquecento designed by Giorgio Vasari for the Grand Duke Cosimo I, the rooms dedicated to the Medici Pope Leo X, the famous room of the Elements, the apartment of Eleonora, and the numerous areas decorated by the masterpieces of celebrated artists of the Renaissance such as Michelangelo, Donatello and Verrocchio. The religious heart of Florence. The Baptistery of San Giovanni is one of the oldest churches in Florence, located in front of the Cathedral of the city, the church of Santa Maria del Fiore. Giotto's bell tower is the bell tower of Santa Maria del Fiore, the cathedral of Florence, and is located in Piazza del Duomo. The construction work was started by the Architect Arnolfo di Cambio and completed after his death by Giotto. The Dome that covers the Florence cathedral built by Filippo Brunelleschi. The palace was built by Michelozzo, commissioned by the patriarch of the Medici family, Cosimo il Vecchio. This was a fantastic tour, we had already walked all over Venice and had a great time but this tour took us to places we would have never gone on our own and our guide was excellent ! We went into residential areas and beautiful spots that weren't nearly as crowded as most.